We continue to trace back the family of Charles Edward Lowry. We started in 1940 and today we look at 1930. In 1940, the Lowry’s lived at 207 N Thornton and paid $31 per month in rent. Ten years earlier, they lived down the block and were paying $35 per month. I’m not certain when they moved. Early family photos I have show the house at 207 Thornton, not 106, which has since been torn down. Lowry, Charles E, head, male, white, 30 years old, married. Age first married: 22. Has not attended school or college since Sept 1, 1929. Is able to read and write. Born in Ohio. Father born in United States. Mother born in Germany. Is a citizen. Occupied as a chemist in a steel mill. Actually at work yesterday: Yes. Is a veteran of the U.S. military or naval forces: No. ” M. Margaret, wife (H.), female, white, age 27, married. Age first married: 19. Has not attended school or college since Sept 1, 1929. Is able to read and write. Born in Pennsylvania. Father born in Pennsylvania. Mother born in Pennsylvania. Is a citizen. Is not employed. ” , Charles J., son, male, white, age 5, single. Has attended school or college anytime since Sept 1, 1929. Born in Ohio. Father born in Ohio. Mother born in Pennsylvania. (H.) is written on the census form and appears to indicate who answered the enumerator’s questions. 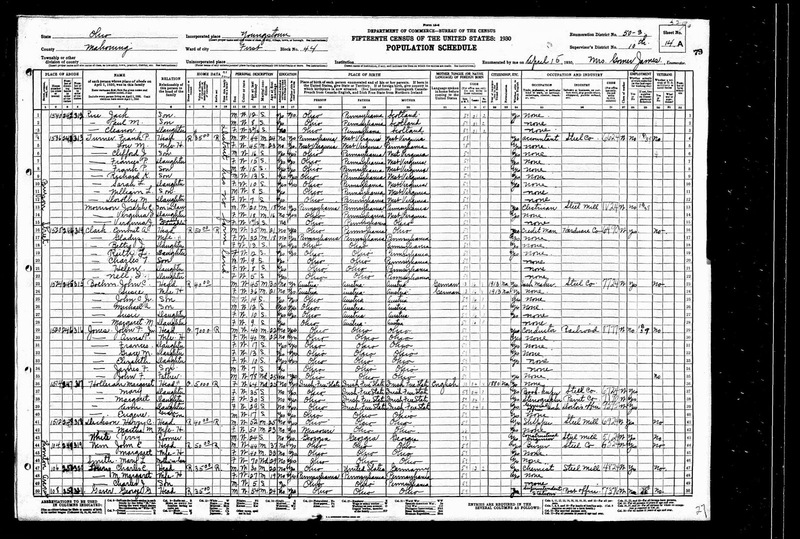 1930 U.S. Federal Census, Mahoning County, Youngstown, population schedule, Enumeration District 50-3, Sheet 14A, Dwelling 250,. Charles E Lowry; digital image, Ancestry.com (http://www.ancestry.com : accessed 10 December 2013), citing Image: 669.0; FHL microfilm: 2341576. National Archives microfilm publication Roll T626.